Seltzer water is man-made, artificially-carbonated water. It is generally sold as a beverage or mixer. It is somewhat similar to mineral water, except that minerals are not used to give it the artificial carbonation. This water is quite popular as a beverage or drink and may often be used instead of carbonated drinks and sugary fruit juices. Medicinally, it is also used to relieve an upset stomach. It can even be used for stain removal. Seltzer water is carbonated using carbon dioxide gas. You can purchase it in flavored or plain varieties. Flavored seltzer water utilizes natural extracts that don’t contain calories or carbohydrates. It is sometimes called sparkling water. This type of water only contains water and the carbon dioxide that gives it the carbonation that drinkers seek. The science is quite simple. Water is filled in bottles and then carbon dioxide is added in gas form with pressurized hoses. After this step, each bottle is immediately sealed. Most seltzer water is made in commercial factories, but some people choose to make it at home, using countertop pressure systems and gas pumps. What is the difference between seltzer water, tonic water and club soda? This type of water is sometimes confused with two related products, club soda and tonic water. The main difference between seltzer water and club soda is that club soda has minerals often added to it. Club soda may also contain salt, to increase the flavor. Tonic water contains sugar and quinine, even though it is bubbly just like seltzer water. Quinine has long been used for boosting the flavor of tonic water, and it relieved malaria symptoms. It was made for British soldiers in the 1800’s, stationed in India, where malaria was a serious health risk. Tonic water contains sugar, so it has more calories than seltzer or club soda. How popular is seltzer water? Seltzer water is a popular drink, since you can drink all you like, without adding any of those dreaded calories. When you break the seal of a bottle of seltzer water, it will fizz, as the carbon dioxide gas is slowly released. You can enjoy this water all by itself, or add lemon or lime. It is a healthy alternative to carbonated beverages made with sugar or high fructose corn syrup, since it has no calories, unlike those other drinks. You can also find flavored seltzer water in stores today, and since it’s made with those natural extracts, it has no calories. What can you use seltzer water for? Many bars and restaurants use seltzer water in their soda fountains and drink stations. It can be added to drink syrup to make fresh soda on-demand. Seltzer water is used as a mixer in many different types of cocktails. It can also add bubbles or fizziness to fruit juice-type drinks. This type of water is sometimes used by practitioners of natural healthcare methods. It is helpful in relieving digestive upset and acidity. Seltzer water has long been used by people to create home remedies. One of these uses is as an agent for stain removal. It removes many stains from clothing as it speeds up the process that breaks down the elements of stains. Whatever carbonated water drink you prefer, you’ll find that they are quite refreshing and flavorful. It is a common belief that carbonated water is not healthy for you. However, Healthline.com reports that as long as they do not contain sugars or citric acid, they are quite healthy. 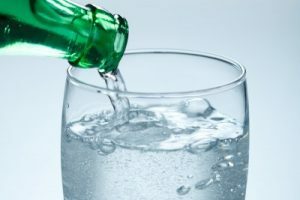 Let’s take a minute to look at some seltzer water benefits and misconceptions. According to studies on women who were post-menopausal, it was found that patients who drank fizzy water for 60 days had lower levels of LDL (bad) cholesterol and higher levels of HDL (good) cholesterol. It is believed that the body’s absorbing and excretion of cholesterol were positively affected by carbonated water’s alkaline pH level. As we mentioned above, fizzy water helps digestion occur more smoothly and relieves digestive system upset symptoms. One misconception about fizzy water is that is destroys tooth enamel. This is simply not true. Studies proved that drinking carbonated water will not harm your teeth. The only time this type of water erodes dental enamel is when it contains citric acid. This applies to both diet and regular soda. Carbonated water does not remove calcium from the bones, nor does it lead to the formation of kidney stones. However, if you suffer from acid reflux, GERD or Irritable Bowel Syndrome (IBS), you should only drink small quantities of carbonated water. Drinking too much seltzer water in these cases may aggravate your condition. Previous articleWhy Do I Feel Like Throwing Up? Next articleWhat Happens If You Fail a Drug Test?